Photo:Dilip Taid, An inside view of the'méram' (hearth)of a traditional Mising stilt house.Here an oldwoman sits near the 'méram'. Through the column of your esteemed daily, I would like to extend my heartiest thanks to Takam Mising Porin Kébang (TMPK) of Jonai-Dhemaji, Mising community of Jonai sub-division and also specially heartiest thanks to those volunteers of TMPK and Mising community who have escorted our aspirants brother and sister who appeared an interview in the department of Tax and Excise in the state Capital. They arrived in full packed of three APST buses along with the banner ‘Siang Adi candidates for interview, department of tax and excise” from Jonai to Gogamukh in Assam during the indefinite bandh call in Dhemaji district in connection wit the recent incident occurred at Pale-Diimo area. I have not seen buses with banner during the bandh call in the last ten years of my stay in Itanagar and I was shocked to see such buses with banner at Itanagar on Nov 8 morning. Here I remember the history/story about Adi-Mising (Adi-Mising Doying) and communities relationship between its and migration of Mising in Assam plain. Since pre-independence Adi (Padam) of Tayeng clan and Mishing clan of Tayeng, Tayung and Taye so on are tie-up and make brotherhoodness (Ani-Biiro). Not only the Tayeng clan of Padam but also some clan of similar clan of Padam also tie-up/make brotherhoodness to some Mising clan of Pegu, Doley, Morang and so on. Lastly, I, once against thank the aforesaid community for their good help to our brothers and sister. And I also on behalf of the Siang Adi community as well as on my own behalf, would like to request both the communities to solve the matter immediately to bring normalcy and to see that such incidents do not occur in future. Through the column of your esteemed daily, I would like to draw the attention of the present government, NGO’s, students union in general and the district administration of East Siang in particular regarding the recent firing incident at Demow. The incident escalated to East Siang and Upper Siang district, creating anarchy and chaos for people living in border areas of Ruksin and Nari and Seren. 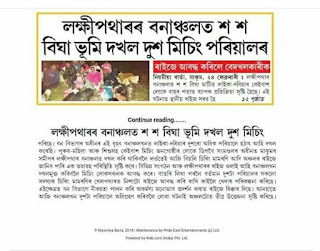 On Nov 7 last, I along with my nephew Samuel Paron of Ngorlung village Ruksin circle went to Jonai to purchase a wall clock for a bereaved family, while returning back around 30-40 TMPK youth from Assam attacked us with sharp weapons leaving my nephew with grievous head and chest injury. This incident happened just in front of Arunachal Pradesh Police. We have lodged an FIR at Ruksin Police Station but till date there is no initiative and action against those culprits. The public, Panchayat leaders, students union of Ruksin area conducted a meeting to solve the ongoing situation and called on TMPK youths a bring normalcy on the area. We have also asked the district administration and local police to bring an amicable solution but our prayers and initiative to save our life and property has been turned down repeatedly. Therefore, I appeal the government of Arunachal Pradesh, students union and all Arunachalees to stand up and unite together to bring a permanent solution to this problem.